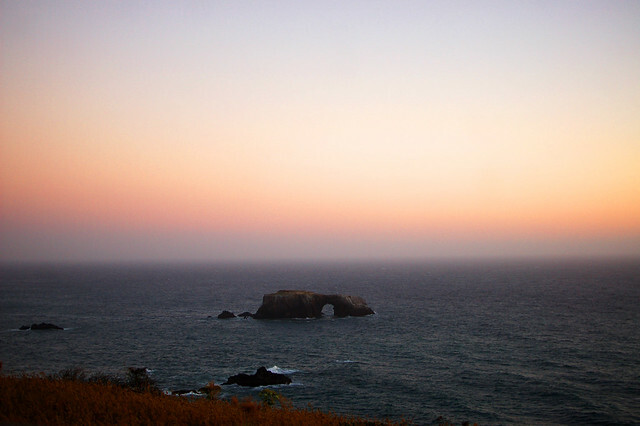 goat rock beach, a photo by hep on Flickr. hi guys! long time no update. when i last left you i had just gotten back from the southern deserts (just because you reroute water there doesn't make it not a desert ok). this last weekend yuriy and i decided to head north to camp along the norcal coast as the kids were away at their uncles for a visit. so we headed up to spend the day at fort ross. 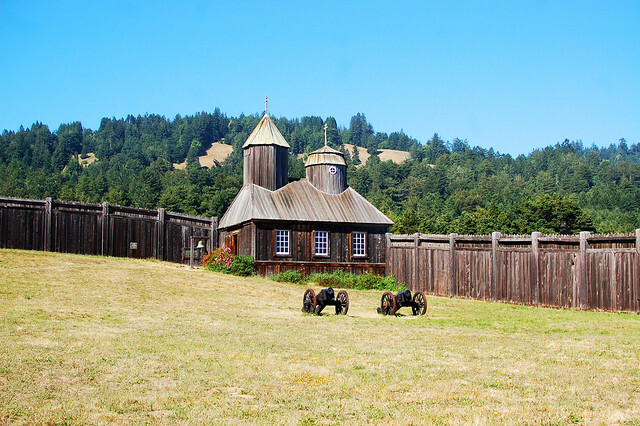 ft. ross is a historical fort where the russian traders settled (for russia) in the early 1800s. sometimes we joke that yuriy's distant ancestor was probably settling the fort while my distant ancestors were settling the sfbay valley over the mountains. for all we know it could be true since some of his family ancestry was russian fur trading and a lot of mine was chicanos settling in the valley for either mexico or spain depending on the era. after hiking around the fort for awhile we headed to the beach. 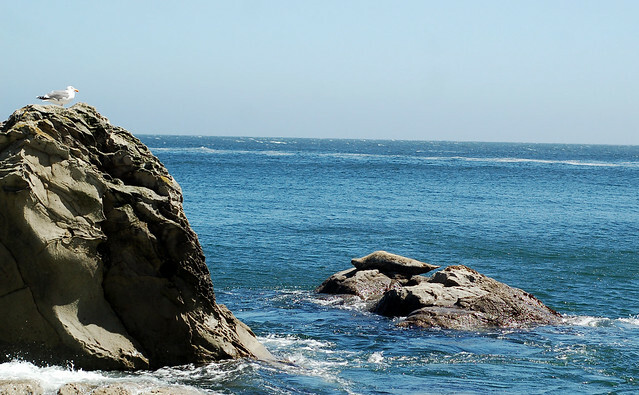 we saw this seal sunning himself on a rock, and a huge jellyfish swarm drifting into the bay. 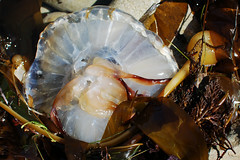 the rocks were covered with stranded jellies bigger than a dinner plate. 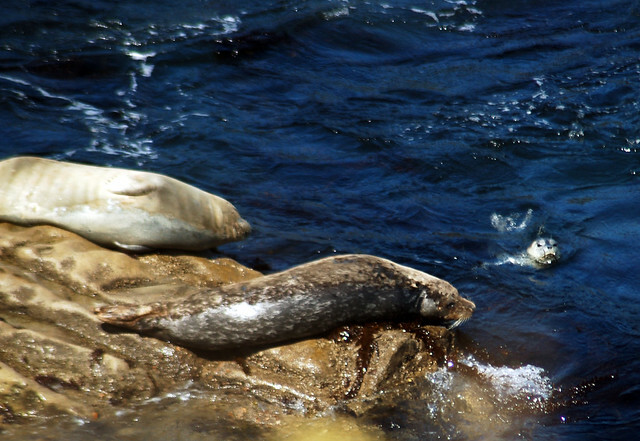 we then climbed the bluffs for a bit and found a lookdown onto these seals sunning themselves on some rocks. turns out they were sunning in the tiny cove because they had their seal pup with them! 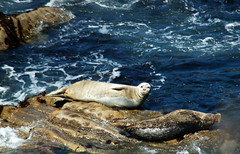 so we watched for about an hour while he played chasing games and constantly snuck over to bug the other sunning seals. then yuriy did some fishing for about an hour. on his 2nd and 4th casts he caught two decent sized ling cod. 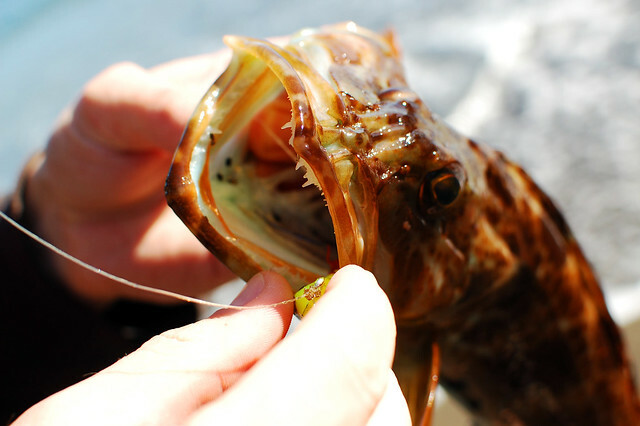 AND he was fishing with his own, handmade, homemade jigs, which is pretty impressive since most people claim you can't catch ling cod on lures. only one was keeper sized, however we let both go. the first fish (the bigger keeper sized) was a beautiful iridescent blue under his mottling. afterwards we took a walk in the cypress forest. 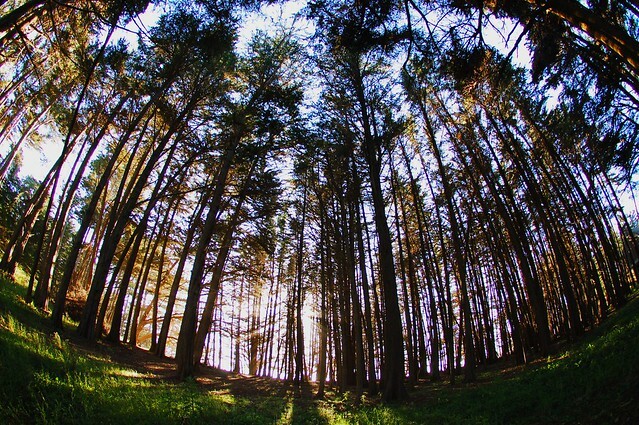 cypress forest is one of my favorite kinds of forest, second only to redwood groves which are the all time best. 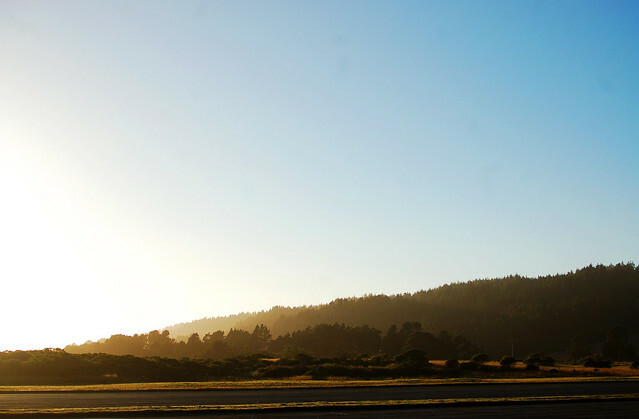 however late afternoon sun (aka the golden hour) gives cypresses a gorgeous mystery. 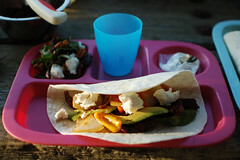 dinner consisted of carne asada & goat cheese fajitas cooked by the roadside on our camp stove, with a baby greens salad in raspberry-gorgonzola vinagrette with candied walnuts and goat cheese. 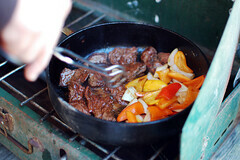 pretty good eating for camping. i love the way the mountain foothills tumble down into the ocean, i even love driving on hwy 1, 200feet above the sea, clinging to the edge of the cliffs on tiny little 1 lane snake winder roads. even tho sometimes it makes me a little unnerved to go past countless slides where the road is starting to slide out. it's still one of my favorite places in the world to drive. i just wish they would repave, and maybe bolster some of the road sinkholes, particularly the giant ones that slope towards the edge, on a blind curve. we will probably be heading back up this weekend, yuriy wants to go another round with the ling cod and rock fish, and i want to hit up this secret beach to try and do long exposures of the milky way (if the moon cooperates). i hope you are all having a fun summer!! I LOVE that picture of you on the rock! and the second to last one. That fish is such a pretty blue. Love all the shots. You're so cute. i will teach you why that fish is blue, because its the same for your ocean up there. along the pacific coast, most of the kelp forests are made of of iridescent kelp, or colloquially knows as rainbow kelp. i have tried and failed for years to photograph this stuff how i see it. 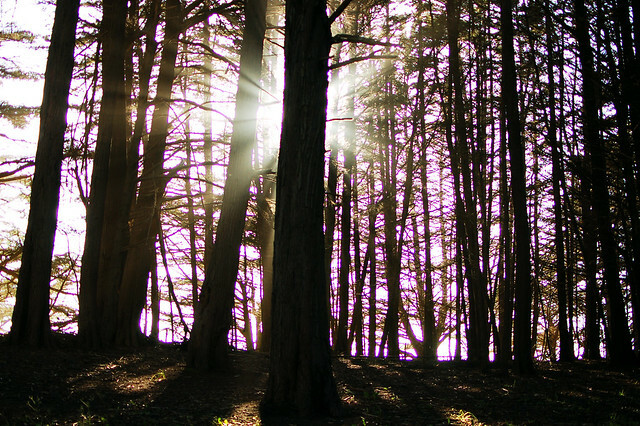 some people are able to get the iridescence but i want the grace and majesty of it too. anyway, its on my bucket list. 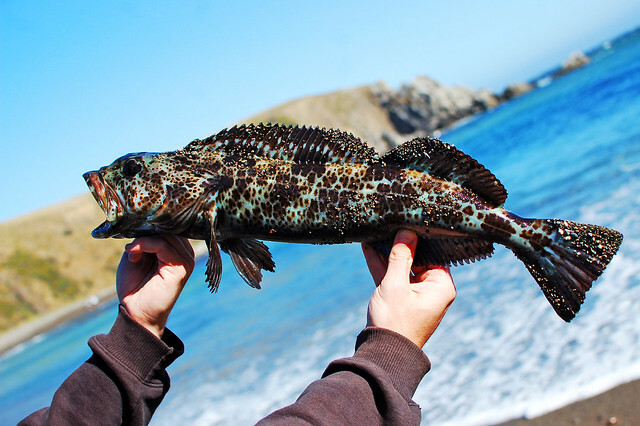 but because of the play of surface colors against the "true" darker brown of the kelp, the ling cod has almost perfect color adaptation to its environment. nature is p fkn amazing! Great pictures! I love the seals *squish*.. And what a super cute picture of you on the rock - love it - the colors are mega! yeah the seals were adorable, i wanted to die when i saw the cub. that balancing seal was no joke either! this is intense. 2 of my sf friends ALSO went camping this weekend in nocal, but not where ya'll were. GO CAMPING WHEN YOU COME OUT! Oh my, that scenery is absolutely stunning. I would just stare at it all day. thats p much what i did while yuriy fished both days. yeah that one is my current fav too! thank you! Blue fish is blue! That's pretty crazy. Gnarly teeth too! I was going to tell you which picture was my favorite, but really can't because they're all so damn good. they had GNARLY teeth it was nuts! and thank you! I have such mad big boi love for Yuri right now it's not even funny. MAKES HIS OWN LURES, CATCHES FISH. Provider. CHEST BUMP YURI!! The visual of this is amazing. another reason i love norcal too, is "summer" here is 55 degrees and windy, no matter how much that pesky sun thing is shining. and more often, summer actually means 50F and foggy out, no stupid sun at all! 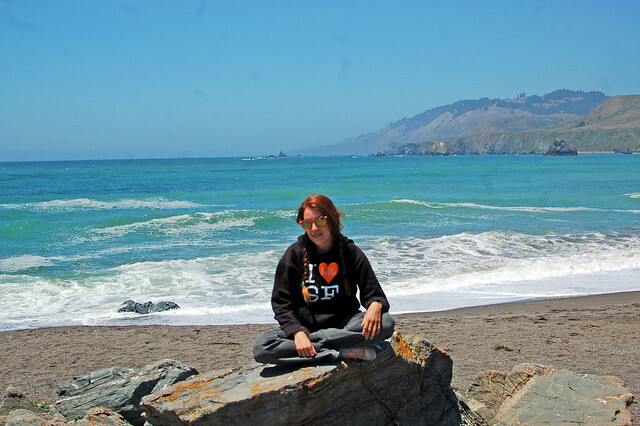 warm summer weather is for those below the nor/so cal defining line (which is somewhere between monterey and santa barbara but people will fight to the death over where it's actually placed), hence me rocking the awesome i (hella) <3 SF hoodie with like 4 layers on underneath. Just amazing. I want to go out there now! I think we will have to find a camp ground in the area in the next couple of years when Adriana is better aged for camping. Your photos are beautiful. That fish is awesome! I love the picture of you on the rock. Such majestic scenery. i think there is phosphorescence more to the south. up here it is very cold. i want to explore the south pacific more, but that has to wait for the kids to get into college. i have not been to that particular beach! 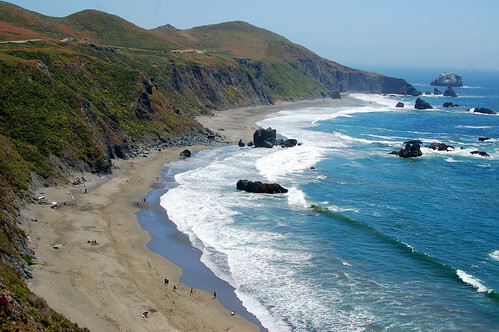 i have been to a couple redwood beaches, like muir, and up near gualala/pt arena areas. i will have to check it out! next summer we want to do a serious ca/or/wa roadtrip all the way up to touch canada with the kids. however, that may be unrealistic considering their on-going summer work schedules hehe! yeah, i guess ive never seen an east coast tidepool! the atlantic seems so weird, it definitely has a different "feel" than that pacific.